Butter and sugar 6 small ramekins or custard cups. Gently wipe the top rims of cups in preparation for soufflés. In medium saucepan over low flame, melt chocolate with butter and sugar, stir constantly until smooth. Remove from heat, stir in vanilla, spices and cayenne. In large mixing bowl, whisk egg yolks until creamy. Gradually mix chocolate into egg yolks, combine thoroughly. In separate bowl, with electric mixer, beat egg whites until stiff but not dry. Starting with a small portion of whipped egg whites, fold gently and gradually into chocolate mixture in large bowl until well combined. Evenly distribute mixture between ramekins. Place on rimmed baking sheet, bake for 30 minutes. Prepare caramel sauce while soufflés bake by whisking brown sugar into whipping cream in small saucepan over high flame. Bring to a boil, boil for 3 minutes. Remove from heat, stir in Kahlua. When soufflés are baked and gently removed from oven, pour some warm sauce on top of each, and serve immediately with remaining sauce if desired. Shopping tips ~ Ten Thousand Villages has local stores in Redondo Beach and Pasadena; see their site for other locations. Mr Marcel is one of the finest sources for world-class chocolate - and spices - right here in LA and, proud purveyors of the Muscovado dark brown sugar I use for the caramel sauce! At the onset of each new year, while most normal people resolve to eat less sweets and avoid calories ... I always crave chocolate cake. Images pop up in my dreams, on billboards, TV, internet ads. Why is this. In addition, this very month, not all that surprising, the Mexican soccer icon Rafa Marquez also popped up on my radar ... maybe in my chocolate cake dreams ... I’m not sure but, I know a sign when it hits me upside the head. I absolutely love world soccer. In 2010, Rafa Marquez was my beautiful muse. He represented Mexico’s National Team for the World Cup recipe series I created with Monsieur Marcel and the Original Farmers Market. I divined Mexican Chocolate soufflés’ with him in mind. It happened that with a recent date, I'd shared a dessert with that name. 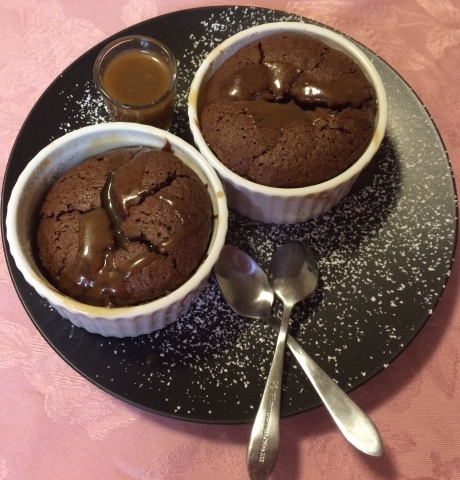 That soufflés’ - not the date, regrettably - became the new object of my obsession. When I learned that Rafa Marquez’ birthday is February 13, and his birthplace in Mexico is noted for its romance, his inspired recipe was pure pleasure to create and perfect. Last night I learned that this man - of course, still beautiful at 36 years of age - has just returned to his original club, Atlas (Guadalajara), to possibly end his stellar career which has taken him to France, Spain, New York, and most recently, Italy. Atlas is like the Chicago Cubs of Mexico ... it is said that those who love suffering, love Atlas. Even still, many of the best players in Mexico began their careers with Atlas and, one of my favorite fans in Guadalajara is an Atlas devotee so, I’m afraid they're my club. My January chocolate cake craving clashed perfectly with this big news about Marquez, which I so look forward to chatting up upon my return to Guadalajara. And by the way, it’s not just any chocolate cake I lust after - in January or any time. It has to be flippin’ extraordinary. 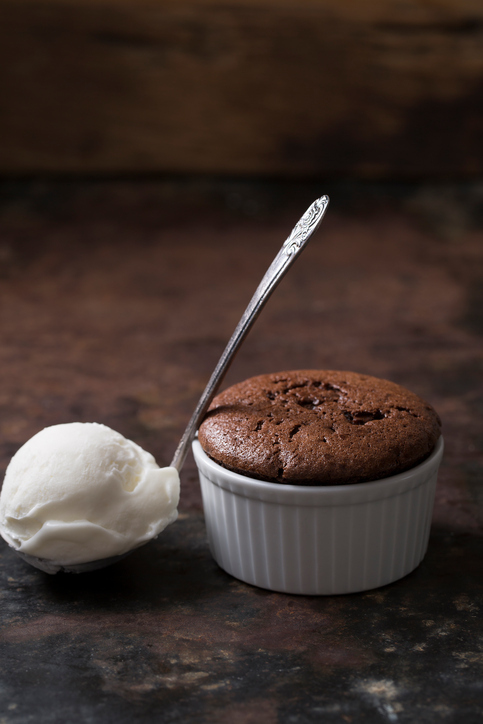 Yes, this one does have elevated soufflés’ status, and, it surely qualifies. It is positively essential to use exquisite chocolate. I happened to wander in to Ten Thousand Villages the other day, and voila, there were fair-trade African chocolate bars labeled Divine at exactly the right price. My craving suddenly became all-consuming. Soon thereafter, those dark and milk chocolate bars were melted into pure butter, sugar, organic eggs, Madagascar vanilla, pinches of cayenne, and spices ... alchemizing all of it into perfect mini-soufflés. Topped immediately with simple caramel sauce of pure cream, Muscovado brown sugar from Mauritius and, Kahlua, one was all-consumed in about 10 minutes ... enjoying this dessert warm is also positively essential. Enjoy ~ here is wishing you a very happy, delicious new year!